- All Grand Canyon day hikes are offered year-round, 7 days a week. - Includes all guides, transportation, necessary equipment, lunch, snacks, drinks, taxes and fees. - Transportation from your accommodations in Sedona, Flagstaff, Williams, Tuscayan, and South Rim is also included. - The Grand Canyon multi-day backpacking trips are guided year-round with the exception of our Rim-to-Rim trips which take place from May to November. - Instead of only offering tours on specific dates, forcing you to join a pre-existing group, CenterFocus will work with you to schedule a trip for when it is convenient for you. - Because of the limited amount of permits offered by the National Park Service, we recommend booking a reservation request at least 5 months prior to the trip if possible. - If shorter notice were the case, we can give you a list of dates that we already have groups permitted for, and you would be welcome to join one of these pre-existing trips depending on availability. - If you request your own trip dates, CenterFocus will immediately begin to work on permitting for these days. You will be notified shortly regarding whether or not permitting was possible. If permitting is possible, we will reserve and guide you on your requested dates. - All trips include guides, permits, necessary equipment, meals, snacks, drinks, training consultation when requested, taxes and fees. - Also includes transportation from Flagstaff, Williams, Tusayan, South Rim locations and the Grand Canyon Village. - Rim to Rim trips depart from Sedona or Flagstaff only. - Custom requests and large group tours can be scheduled 7 days a week, contact us for details. 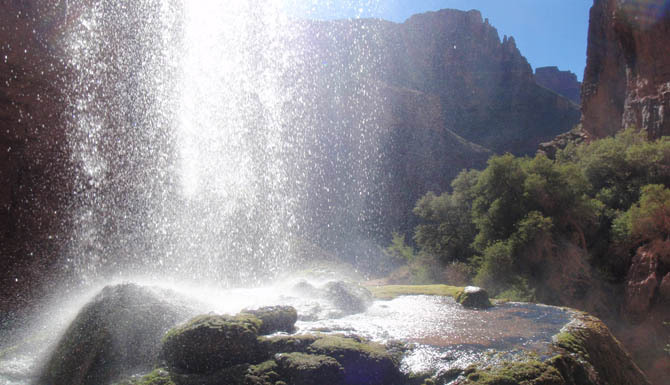 - Havasupai is guided from March to December and may be booked anytime. - All backpacking tours to Havasupai include all equipment, mules to carry your gear to and from basecamp, permits, meals, training consultation when requested, snacks, drinks, taxes, and permit fees. 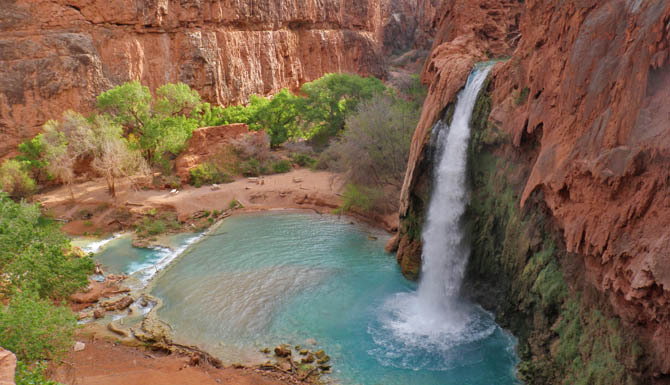 - All Havasupai backpacking tours include transportation from Sedona, Flagstaff, Williams or Seligman. - Heli-based tours are only available on Thursdays, Fridays, Sundays, and Mondays from March 15 to October 14 and on Fridays and Sundays from October 15 to March 14. - Trip includes guides, transportation, equipment, drinks, snacks, taxes and fees. 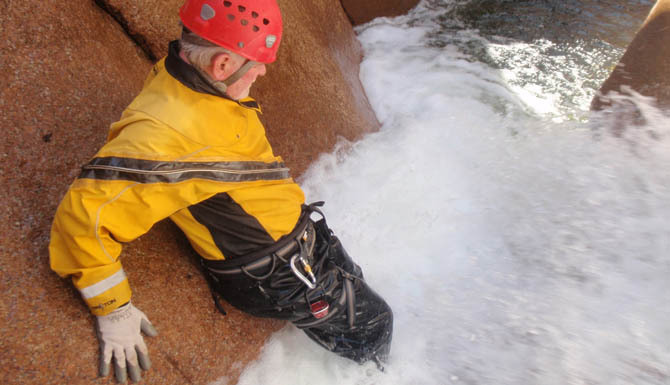 - Canyoneering can be booked year-round, 7 days a week. - Because of the dynamic nature of these ever changing canyons, at certain times of the year some of the advertised canyons will not be available, while other canyons are. Contact us for further details on the status of specific canyons as conditions constantly change. - Trip includes guides, equipment, drinks, snacks, taxes and fees. - Because of the dynamic nature of these ever changing canyons, at certain times of the year some of the advertised canyons will not be available, while other canyons are. Contact us for further details on the status of specific canyons. Conditions constantly change. - Available all year-round, 7 days a week. - Includes guides, transport to and from hotel, daypacks, lunches, snacks, entrance fees, drinks and tax. *seasonal sunset launch @ 5:30pm - you may request this special tour time.